John Godfrey Saxe? Frederick Locker-Lampson? Anonymous? But the worm was punished for getting up early. Do you know who crafted this rejoinder? That artificial cut-off, — Early Rising! So let us sleep, and give the Maker praise. Otto von Bismarck? John Godfrey Saxe? Claudius O. Johnson? To retain respect for sausages and laws, one must not watch them in the making. I looked for some clear references to texts written by Otto von Bismarck and translated into English to justify the attributions. I could not find anything. Could you investigate this quotation to find out who really said it originally? 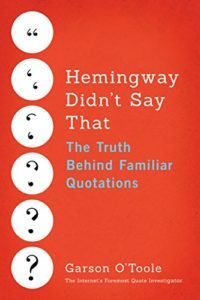 Quote Investigator: Quotation experts Fred Shapiro and Ralph Keyes have identified the most likely originator of the aphorism. Before presenting that evidence QI will give the details of a citation in an American history textbook from the 1930s. This post ends with information about a bizarre duel involving sausages that was reported in the 1860s.